This article will describe how you can enable e-mail authentication (DomainKeys and SPF) on your web hosting account. Email authentication lets you verify the origin of an email message sent to or from your domain. This feature assists in combating spam, or unwanted email. DomainKeys provides a way to verify the sender and integrity of a message. It allows an email system to prove that a message was not altered during transit (meaning it is not forged) and that the message came from the specified domain. Note: DomainKeys is only effective if enabled on the authoritative DNS server for the zone. Sender Policy Framework (SPF) allows a recipient server to verify that an email message was truly sent from the domain specified in the From: field. Enabling SPF can prevent your server from receiving replies to spam that forged your domain name as part of the sender’s address (also known as “backscatter”). 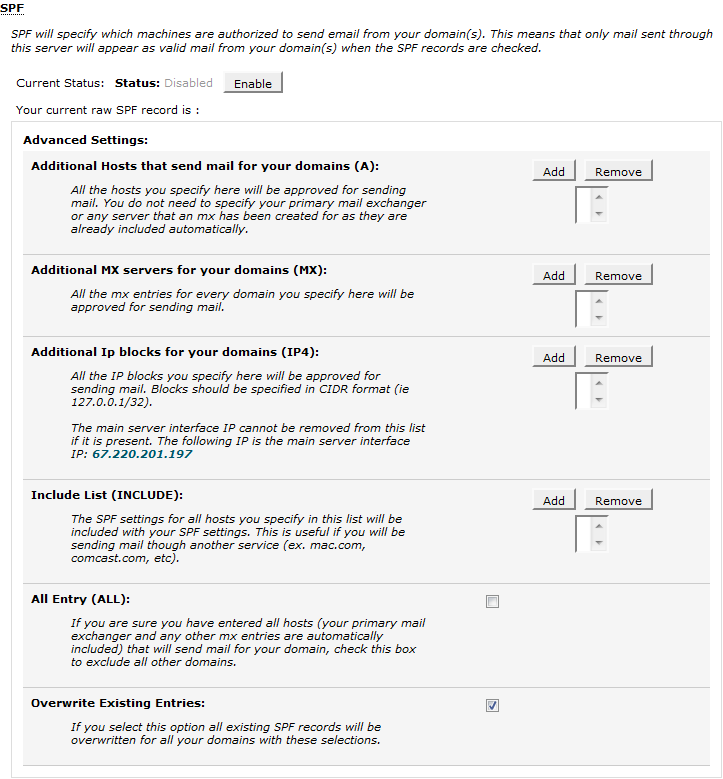 SPF works by specifying which servers are authorized to send email from your domain. Only mail sent through an authorized server will appear as valid when a recipient checks a message’s SPF records. To enable DomainKeys, you will first need to login to cPanel. Once logged in, navigate to Mail >> Email Authentication. Next, select Enable to enable DomainKeys. You have successfully enabled DomainKeys. To enable SPF, you will first need to login to cPanel. Once logged in, navigate to Mail >> Email Authentication. Next, select Enable to enable SPF. Next, review the Advanced Settings and make any changes, as necessary. NOTE: If you haven't configured additional domains or different MX records on your web hosting account, you can safely bypass the Advanced Settings. Click Add or Remove to add or remove additional hosts, servers, and IP blocks in the corresponding lists. Click the All Entry (ALL) box if you have entered all hosts that will send to your domain and wish to exclude all other domains. Click the Overwrite Existing Entries box if you wish to overwrite all existing SPF records for all your domains with these settings. You have successfully enabled (and/or configured) SPF for your web hosting account. It might be helpful to include something about what happens if you turn on DKIM and get an error message (as I just did) regarding cPanel being 'unable to verify that this server is an authoritative nameserver for [domain name]', in case this is a frequent occurrence. Also, more detail on the advanced options for SPF would be helpful since the dialog itself isn't terribly informative. I've been in IT and on the internet 20+ years but I don't know a whole lot about domains and hosting, and this section had me swamped. I turned on SPF and then had no idea what I should do with the next section, so I'll be turning it off again. To sum up: more directed instructions and/or observations rather than just screenshots of the dialog boxes, which aren't very intuitive to the uninitiated.